They had a chance. The Colts did not play well in this game at all. From the struggling defense to instances of poor protection, penalties, and poor decisions, the team didn't have it. Still, they had a chance to score the go-ahead touchdown late in the game. But the thing is... You can't expect Andrew Luck to pull something out of his hat every week. You do that, you're going to lose some. I know every game can't be a blowout, but having a nail-biter every week puts undue pressure on everyone. About that dominant defense... A big emphasis for the Colts this offseason was improving the defense. Yet, the defensive unit got gashed by Ryan Tannehill and couldn't get key stops. As it stands, no one has faith in the defense, especially after Miami surged ahead to a 14-3 lead. It's not just the big chunks, either. It's the little things like giving up a 21-yard pass to Charles Clay near the end of the second half. That play allowed Miami to get in position for a field goal just before halftime. And at the end of the game, the Colts allowed an 8-yard run that let Miami run out the clock. Then again, the pass rush came around. Occasionally. The Colts sacked Ryan Tannehill five times and forced a fumble (more on that later). Jerrell Freeman and Robert Mathis had two sacks apiece while Bjoern Werner and Pat Angerer split one. At times, the Colts showed a great push and bothered Tannehill. Other times, you wondered why they even bothered to send blitzers because Tannehill had so much time. The Colts are going for a high-risk, high-reward defensive philosophy, and so far, it's not consistent enough. Luck under pressure. For much of the game, the Colts did a decent job of protecting Luck and picking up blitzes. In the second half, that changed. Luck scrambled more often, got hit, and nearly threw a couple picks. He had Coby Fleener for a touchdown late in the game, but pressure caused the throw to be inaccurate. It was almost picked off...a theme of Luck's throws in the second half. Fourth and ten. After three straight incompletions--a pass to Hilton that had no chance, a pass to Fleener that was almost picked, and a pass to Whalen that was broken up--the Colts faced fourth and ten. It's do or die time. Donald Brown misses a blitzing Philip Wheeler--seriously, Brown had himself a delicious FieldTurf sandwich--and Luck gets buried for a loss. The awesome quarterback can't make an awesome play if he doesn't have some awesome time to make an awesome throw. Just Fleener bein' Fleener. Coby Fleener drops a pass on a play action play that looked like it couldn't been a big one. Just Fleener bein' Fleener! I'm unusually hard on Coby Fleener, so I have to give him some props. He had a nice game, took advantage of some mismatches, and caught a touchdown pass. Actually, he caught two touchdown passes, but one of them didn't count. If this is the type of effort we'll see from Fleener, I'll happily take it. Missed opportunities. Dominique Jones (who?) didn't "finish the catch" on a ball that would've put the Colts at the goaline. Luck tried to run a play, but Miami challenged it and the catch was correctly overturned. Two plays later, Fleener caught a 15-yard TD pass that was nullified by an illegal shift penalty. The drive ended with a 38-yard field goal from Adam Vinatieri. Keep in mind that the Colts got the ball at the Miami 39 to start the drive. More missed opportunities. The Colts challenged a first down run by Tannehill on a QB keeper; the defense nearly buried him. The Colts took over on their own 39 after challenging the call and proceeded to thrown an interception in the end zone. The interception. If there's one play Luck would like to have back, it's this one. On first and ten, he threw up a prayer to the end zone intended for Reggie Wayne. #87 was well covered and had no chance at catching the ball. Brent Grimes intercepted it. Miami didn't score on its next possession, but the Dolphins picked up a pair of first downs and chewed more than four minutes of clock time. The Colts defense finally forced a stop, setting up the team's final, ill-fated possession. Doink. Adam Vinatieri's 52-yard field goal looked good at first before fading late and bouncing off the upright. Hurting more than the missed FG was the fact that the Colts failed to convert in a third and short situation that would've kept the offense driving. The Big Play. The Colts had a few of their own, but they spent most of the game giving them up to the Dolphins. Brian Hartline (24 yards), Charles Clay (67 yards), and Mike Wallace (34 yards) each had a catch that went for 20+ yards. While the Colts showed some flashes on defense, the big plays were crippling. Red zone struggles. 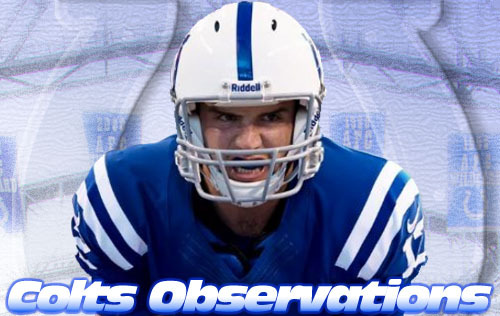 The Colts were 2-4 in the red zone and had to settle for field goals twice. They're usually pretty efficient in this area of the field, but they certainly struggled. That weird fumble call. Well, the officials got this one right, but it sure as heck looked weird. The Colts defense was all over Tannehill, who appeared to get hit as he threw. Replays showed the ball was jostled from Tannehill's hand before he made a throwing motion, making it a fumble. The officials originally ruled it a fumble on the field, showing they've got fantastic vision. Home loss. You always want to hold your homefield. The Colts face a stretch of tough games--they get to visit a very angry San Francisco 49ers team next week--and needed to beat the Dolphins to start the season strong. Faltering at home was the last thing they needed; they play three out of their next four on the road before hosting Peyton Manning and the Broncos. And that home game in that four game stretch? The Seattle Seahawks. Injury report. Donald Thomas, a free agent acquisition signed to bolster the offensive line, suffered what could be a season-ending injury. Darrius Heyward-Bey suffered a shoulder injury that required an MRI. Griff Nation. Since Griff Whalen filled in for DHB (and made a big catch), I propose the hashtag #griffnation. Just because.